Auto Sync your OpenCart store orders & securely ship them at the lowest shipping rates to more than 19,000+ serviceable PIN codes with best logistics courier partners for eCommerce in India. Automate your online store’s logistics, save time & money with ShipRocket eCommerce shipping extension. ShipRocket-Opencart shipping plugin brings all your order deliveries, fulfillment and inventory management on one platform. It reduces your costs by connecting you with reliable and trusted multiple eCommerce courier companies that provide prepaid and cash on delivery (COD) services. The shipping extension will import your online business’s inventory and orders from multiple sales channels like Amazon, eBay, etc. with ease. Simplify your eCommerce fulfillment today. With ShipRocket’s OpenCart shipping module, you can start delivering products to your customers and get orders on your OpenCart store in absolutely no time. 1. Automatic Order Sync – Integrating your OpenCart website with the ShipRocket panel allows you to automatically sync your orders from the OpenCart panel into the system, with just one click. With ShipRocket, you would get access to the complete order data, including buyer’s address & product details on the panel. 2. 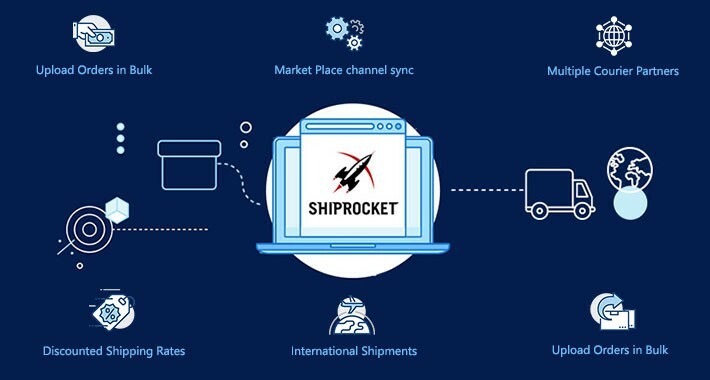 Automatic Shipping Status Sync – All the orders are automatically tracked that are processed via the ShipRocket panel, and the status of the same will automatically be updated on OpenCart. 3. Catalog & inventory Sync – All the active products on the OpenCart panel will automatically be fetched into the system, and correspondingly the stock count for products on OpenCart can be managed from ShipRocket Panel. Shiprocket provides cool and very helpful solution for running my business, really very helpful. Moreover support team is too good. Very nice app, easy integration, good user experience.